Or, La Trahison des Images. Or, Ceci N’est pas une pipe. Or, This is Not a Pipe. Painted by the surrealist René Magritte in 1928-1929. Here, and elsewhere, he mythologizes everydayness by taking quotidian objects, transplanting them in another world, another time, until they lose their mundane, everyday, quotidian qualities, until they have lost their everyday thingness. Here, Magritte transplants the pipe into the world of language. 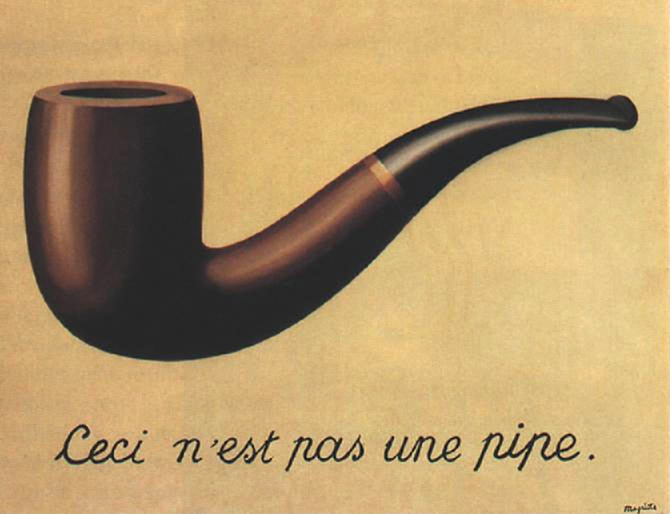 This painting, The Treachery of Images, is not a pipe, which is the point, it is a painting. (And it’s located at the Los Angeles County Museum of Art.) This painting is a sign, a representamen, a signifier. It’s not a joke. Ceci n’est pas la plaisanterie. It’s semiotics. And yet people scoffed at him. And some people were truly outraged. Ferdinand de Saussure, the grandfather of the linguistic sign. His students posthumously published his lecture notes in 1916 on linguistics: Cours de linguistique générale. He is the first to define the linguistic sign as a two-sided entity, a dyad. One side of the sign is called the signifier, which is the material aspect of the sign, the word, the grapheme, the phoneme. And the obverse side refers to the signified, or the mental concept. 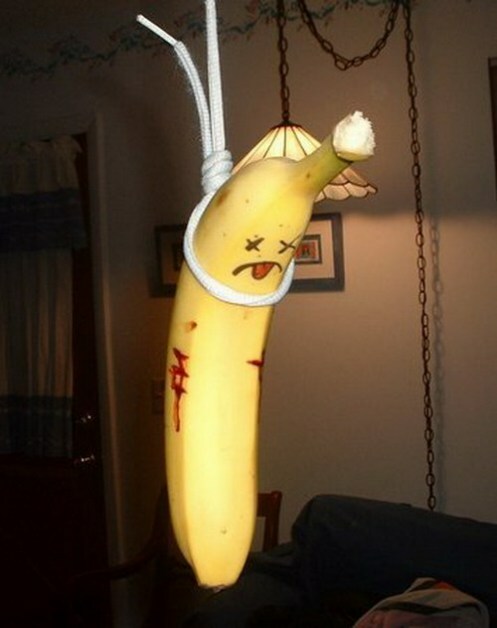 The word “banana” in English is made up of the signifiers /b/ /a/ /n/ /a/ /n/ /a/, but what is engendered for the hearer is not the “real” banana, the banana committing suicide, but a mental concept of “banananess”: yellow, fruit, sweet, mushy, phallic, peel, slipping, yummy, nom nom nom. The “real” banana is the banana in the sentence, the one being described, not a general banana. In this instance, the “real” banana is this poor fella dangling from the shoelace. In other words, there is no natural reason why the signifier “banana” should engender the signified. The relationship is purely conventional, it exists because of conventional rules, conventional agreements. This system only functions because signs signify by virtue of their difference from other signs. Words and signs can never fully articulate what they mean; they can only be defined through appeal to other words, from which, they differ. Thus, meaning is perpetually deferred, or postponed through an endless chain of signifiers. Saussure didn’t push this idea far enough. To it’s obvious conclusion. Derrida accuses Saussure of privileging the spoken signifier over the written signifier, that the former is somehow closer to the signified. This is logocentrism. The spoken sign is pure, where the written sign is meddlesome, in the middle, merely a bridge from thought to communication, which it is, but they both are! Derrida doesn’t understand why people fight mediation. It is what it is. Both speech and writing are systems of difference. Both words are pronounced the same exact way (especially in French), but the distinction between them can only been seen in writing. Beautiful Catherine! I love the way you extrapolate this concept to words- that we define them by using other words that mean different things and so starts an endless voyage into meaning… that any word in itself is far from an absolute description of what they seemingly describe- you really opened my eyes!